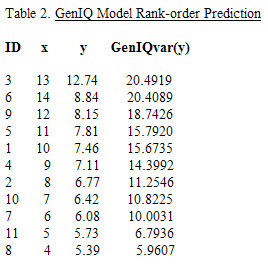 The effectiveness of the GenIQ data-straightener method as seen in this "small" exercise is typical, for big data (i.e., many variables and many observations) as well as small data. 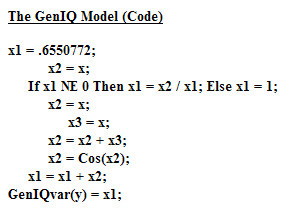 (Also worthy to note, for big data, the GenIQ data-straightener simultaneously, in a multivariate sense, straightens all the predictor variables with the target variable.) Oh! 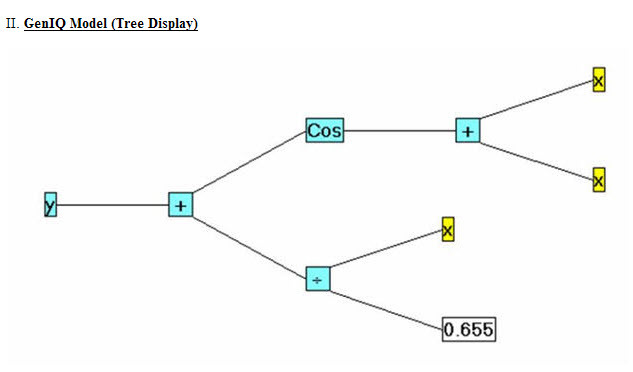 Two things - the correlation coefficient value for x and y is 0.81629, a dubious measure the linear relationship between the two variables; the correlation coefficient value for x, and GenIQvar(y) is 0.9895, an undoubtedly reliable measure of the linear relationship between the two variables.